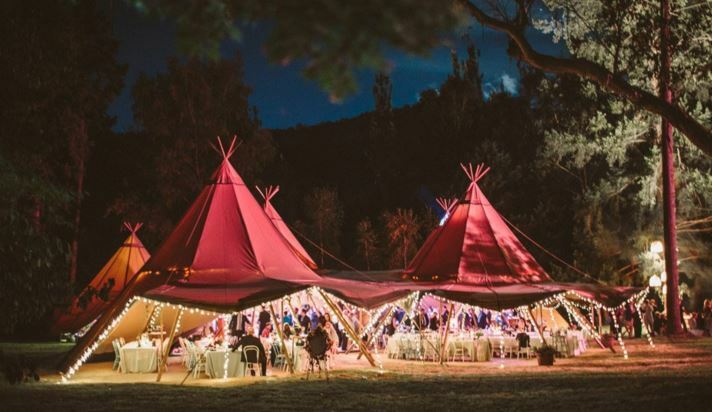 The Retreat offers a very unique venue for weddings with a very private and peaceful bushland setting but to make your special day even more unique and memorable you can not go past the beautiful Tipi style marquees. apart from the others in a relaxed, natural and eco friendly way. These are perfect for weddings all year round but especially for Winter weddings with beautiful wood fires available to be placed in the centre of the tipi, now that is special. The amazing marquees are brought to you by Katalane who are bursting with innovation, and are solely driven by desire to create a unique experience for clients. Katalane tents speak for themselves when it comes to their appearance, but their true beauty happens behind the scenes. With their design originating in northern Lapland from the nomadic Sami people, they really are designed to withstand the harshest of conditions whilst still having an elegant and natural appearance. t they have a patented linking system, allowing the marquees to be joined together in unlimited combinations and numbers to suit your event. All our Katas are hand made out of primarily natural materials sourced in Sweden. Ask about the brand new, American made, Hamptons marquee. These stunning beauties are hand made by skilled sailmakers, the sailcloth is held up by system of solid pine poles making them super sturdy while keeping an elegant swagger. Never s een before in Australia you can be sure there will be more than a few stunned guests. At The Retreat we offer accommodation for for up to 120 guests in a range of accommodation options. Ideal for all your family and friends to stay and celebrate in the one location. Also brilliant onsite facilities and things to do to keep everyone relax, entertained and creating amazing memories.